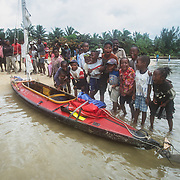 In 2002 I was awarded a Travelling Fellowship Grant by the Winston Churchill Memorial Trust to be the first person to attempt to circumnavigate the island of Madagascar by sea kayak. I first heard about this potential opportunity from the chairman of a kayaking club that I was doing a talk for; in his words I was exactly the kind of person that they are looking for. The Trust’s objective is to provide opportunies for UK citizens to go abroad on a worthwhile enterprise of their own choosing, with the aim of enriching their lives by their wider experience; through the knowledge, understanding, and/or skills they gain, and on their return, enhancing the life of their community by their example and the dissemination of the benefit of their travels. I wanted to have an adventure that would satisfy those requirements, and broaden the scope of my successful environmental presentations in schools to include tropical rain forests and coral reefs. I had been fascinated with Madagascar since my childhood after watching the early David Attenborough documentaries. It is a living laboratory of some of the world’s most endangered plants and animals; the majority of them found nowhere else on earth. It is in the top eight mega-biodiversity countries in the world but sadly it is also in the top four or five most threatened biodiversity hotspots in the world. People only arrived in Madagascar about 2,000 years ago and already 80% of the unique forests have been destroyed. In addition to the unique terrestrial habitats it is likely that it possesses a greater diversity of marine habitats than any other western Indian Ocean country. It even has a population of migrating humpback whales that travel from Antarctica to Antongil Bay in the NE between July and October to breed. I knew that attempting to circumnavigate the world’s fourth largest island by kayak alone was a massive challenge, but my main objective was just to experience and photograph as much of that special island as possible. The flora of Madagascar is exceptionally unique and biodiverse, with more than 80 percent of the island's 14,883 plant species found nowhere else in the world. The prehistoric breakup of the supercontinent Gondwana separated the Madagascar-Antarctica-India landmass from the Africa-South America landmass around 135 million years ago. Madagascar later split from India about 88 million years ago, allowing plants and animals on the island to evolve in relative isolation.‪ This distinctive ecology has led some ecologists to refer to Madagascar as the "eighth continent",‪ and the island has been classified by Conservation International as a biodiversity hotspot.‪ Much of the island was originally forested, but nearly all this forest cover has been lost due to increasing global temperatures and human deforestation. 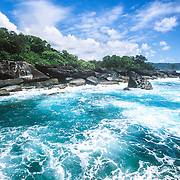 The largest remaining stretch of old growth rain forest lies along the eastern coast of the island. The western and southern sides of the island, which lie in the rain shadow of the central highlands, are home to dry deciduous forests, spiny forests, and deserts and xeric shrublands. Due to their lower population densities, Madagascar's dry deciduous forests have been better preserved than the eastern rain forests or the original woodlands of the central plateau.‪ Five plant families are endemic to Madagascar.‪There are several endemic families including the Asteropeiaceae, Sarcolaenaceae and Sphaerosepalaceae. 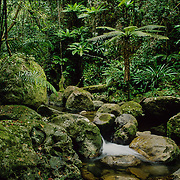 The humid eastern part of the island was formerly covered in rainforest with many palms, ferns and bamboo, although much of this forest has been reduced by human activity. The west has areas of dry deciduous forest with many lianas and with tamarind and baobabs among the dominant trees. Subhumid forest once covered much of the central plateau but grassland is now the dominant vegetation type there. The family Didiereaceae, composed of four genera and 11 species, is limited to the spiny forests of southwestern Madagascar.‪Four-fifths of the world's Pachypodium species are endemic to the island.‪ Three-fourths‪ of Madagascar's 860‪ orchid species are found here alone, as are six of the world's eight baobab species.‪ The island is home to around 170 palm species, three times as many as on all of mainland Africa; 165 of them are endemic. Many native plant species are used as herbal remedies for a variety of afflictions. The drugs vinblastine and vincristine, used to treat Hodgkin's disease, leukemia and other cancers, were derived from the Madagascar periwinkle. I also loved reptiles when I was a child and was always out somewhere catching snakes and lizards, and keeping them for pets. Madagascar has two of my favourite reptiles, chameleons, and the extraordinary Uroplatus or leaf-tailed geckos. It is home to more than 300 species of reptiles of which more than 90 % are endemic (36 of the 64 genera are also found nowhere else). Madagascar’s reptile fauna includes lizards, snakes, turtles and tortoises, and crocodiles. The island has boas instead of pythons, which are found in nearby Africa and throughout Asia, along with front-fanged venomous snakes. It is a strange anomaly that Madagascar’s iguanid lizards and boas have their closest relatives in South America; evidence of the island’s prehistoric connection to the supercontinent, Gondwanaland. The uniqueness of the island’s reptiles has resulted in widespread collecting for the exotic-pet trade. 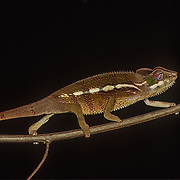 Some species of chameleons, geckos, and tortoises are threatened due to unsustainable collection. I will be adding the locations for the majority of the photos in due course and identifying the individual species wherever possible. It’s always possible when photographing the smaller fauna in a country with so much biodiversity as Madagascar that I may have photographed something previously unrecorded by science, which always adds to the tremendous excitement and incentive that I feel when I’m exploring somewhere as amazing as Madagascar. As with much of the unique, endemic wildlife of Madagascar you view the birds and mammals with a mixture of awe and sadness because you are always aware how unique they are in the world, and how much of their natural habitat has been destroyed in such a historically short period of time. That is certainly how I felt when I encountered the largest of the lemurs, the Indri, for the first time. They are such beautiful creatures, almost too adorable too be true, and their haunting call adds such an essential ancient dimension to the biodiverse forests of Alaska. The same could be said for the equally adorable sifakas that have adapted so remarkably well to living in the rapidly disappearing, spiny dry-forests in the most arid regions of Madagascar. Madagascar lacks the dominant form of primate distributed worldwide, monkeys, chimps and gorillas. Instead their niche has been filled by an older group of primates, the lemurs. They exist in isolation there because until around 160 million years ago, Madagascar was attached to the African mainland as part of the supercontinent, Gondwanaland. It then moved away from Africa where the first lemur-like primates on the fossil record appeared roughly 60 million years ago and crossed over to Madagascar shortly thereafter. The island continued to drift eastward and by the time monkeys appeared on the scene 17-23 million years ago, Madagascar was isolated from their arrival. 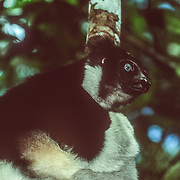 The lemurs were isolated from evolutionary changes of the world and radiated into the large island’s many niches without too much competition or predation. Today they are found in virtually all of Madagascar’s ecosystems and share some of the social and behavioural characteristics of monkeys. Today Madagascar is home to 33 species of lemurs across five families and 14 genera, ranging in size from the 25-gram pygmy mouse lemur to the indri. Giving it the second highest number of primate species after Brazil, and new species are still being discovered. I started my epic journey at Madagascar’s largest sea port, Tamatave, and my first destinations were Isle Ste Marie, and Antongil Bay for the humpback whales and the Masoala Peninsula, the largest area of intact lowland rain forest remaining in Madagascar. I wasn’t prepared for just how exposed the long uninterrupted coastline on the east coast is, and I quickly fell victim to the huge ocean swells and the incessant surf pounding the exposed beaches. Landing and launching my fully laden, heavy kayak with a large open cockpit was going to be a regular challenge; I nearly lost everything on my first landing. I kayaked along stretches of isolated coastline that were completely off the beaten track and encountered people that had probably never ever seen any foreigners before. I found the people to be very curious about me, friendly and hospitable, but a little shy because it was a new experience for them. I suffered a series of accidents along the way that left me with many debilitating sores that were very slow to heal. It was difficult to find adequate nutrition along the way for the physical demands of my journey. I was shocked not only by the de-forestation and habitat destruction that I encountered, but also by how degraded the marine habitats and coral reefs are; every morning I witnessed large numbers of local people walking all over the reefs, and foraging with sticks in a very destructive manner. I was also somewhat dismayed by the Masola Peninsula where I encountered a lot of intrusive slash and burn farming within the boundaries of the supposedly protected forest. I suffered a very bad leg infection whilst exploring the streams of the Masoala Peninsula and had to paddle around the exposed outer coast under great discomfort to try to get to a doctor in the nearest town, Antalaha. Getting in and out of the abrasive, fringing coral reefs, that were being constantly pounded by heavy surf, presented me with the most harrowing of kayaking challenges along the way. There was a veritable cornucopia of weird and wonderful invertebrates to discover in Madagascar. As with the frogs and reptiles, it was the ingenious evolution of camouflage that amazed me the most. Madagascar is home to a huge variety of insects, the majority of which are endemic. 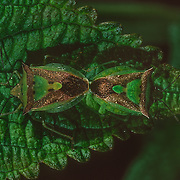 Thousands of species are present in some groups such as the beetles and moths. There are approximately 100,000 species of insects and counting in Madagascar. Distinctive species include the bizarre long-necked giraffe weevil, the huge comet moth and the butterfly-like Madagascan sunset moth. About 80 species of stick insect occur; the Achrioptera species are large and colourful while others are small and very well camouflaged. Many of the island’s praying mantises are also superbly camouflaged, mimicking dead leaves or bark. There are over 100 cockroaches, including the large Madagascar hissing cockroach. I will be adding the locations for the majority of the photos in due course and identifying the individual species wherever possible. It’s always possible when photographing the smaller fauna in a country with so much biodiversity as Madagascar that I may have photographed something previously unrecorded by science, which always adds to the tremendous excitement and incentive that I feel when I’m exploring somewhere as amazing as Madagascar. Ever since I was a child I have always particularly loved frogs and kept them for pets, so somewhere like Madagascar that has over 300 species of frogs and still counting, 99% of which are endemic, was a frog heaven for me. 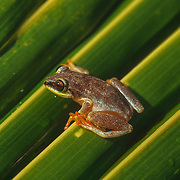 Frogs are the only amphibians as there are no toads, salamanders, or newts. I used to look forward to the twilight hours every evening to start searching for new species, and to hear the amazing frog chorus, turned on if by a switch; every species contributing its own unique noise to the nocturnal symphony. An exploratory journey up a stream would reveal different species at every level; the most species I found in one evening was about 10 at Montagne D’Ambre National Park. The level of camouflage displayed by many of the species was extraordinary, especially the array of very small, almost invisible “l.b.js.” – “little brown jobs,” down amongst the forest litter. Mantella are among the most striking of frogs, and fill a similar ecological niche to the poison dart frogs of South America in that both use bright colours to advertise their toxic skin secretions to predators. Using an opposite survival strategy are the Mantidactylus, which rely on cryptic camouflage instead of gaudy colours. There are also many tree frogs ( Boophis, Heterarixalus) and a group of toad-like frogs including the tomato frog (Dyscophus antongili), which releases a sticky glue-like secretion that protects it against snakes. I will be adding the locations for the majority of the photos in due course and identifying the individual species wherever possible. It’s always possible when photographing the smaller fauna in a country with so much biodiversity as Madagascar that I may have photographed something previously unrecorded by science, which always adds to the tremendous excitement and incentive that I feel when I’m exploring somewhere as amazing as Madagascar. In 2002 I was awarded a Travelling Fellowship Grant by the Winston Churchill Memorial Trust to be the first person to attempt to circumnavigate the island of Madagascar by sea kayak. I first heard about this potential opportunity from the chairman of a kayaking club that I was doing a talk for; in his words I was exactly the kind of person that they are looking for. The Trust’s objective is to provide opportunies for UK citizens to go abroad on a worthwhile enterprise of their own choosing, with the aim of enriching their lives by their wider experience; through the knowledge, understanding, and/or skills they gain, and on their return, enhancing the life of their community by their example and the dissemination of the benefit of their travels. I wanted to have an adventure that would satisfy those requirements, and broaden the scope of my successful environmental presentations in schools to include tropical rain forests and coral reefs. I had been fascinated with Madagascar since my childhood after watching the early David Attenborough documentaries. It is a living laboratory of some of the world’s most endangered plants and animals; the majority of them found nowhere else on earth. It is in the top eight mega-biodiversity countries in the world but sadly it is also in the top four or five most threatened biodiversity hotspots in the world. People only arrived in Madagascar about 2,000 years ago and already 80% of the unique forests have been destroyed. In addition to the unique terrestrial habitats it is likely that it possesses a greater diversity of marine habitats than any other western Indian Ocean country. It even has a population of migrating humpback whales that travel from Antarctica to Antongil Bay in the NE between July and October to breed. I knew that attempting to circumnavigate the world’s fourth largest island by kayak alone was a massive challenge, but my main objective was just to experience and photograph as much of that special island as possible.